Towards a New Understanding of Sraffa examines the legacy of Piero Sraffa by approaching his ideas in a new light, thanks to the insights gained from the opening of the archive collection of his papers at the Wren Library (Trinity College, Cambridge, UK). It provides a refreshing perspective into Sraffa's approach to money, the role of equilibrium and of the surplus in economic theory. The study is backed by previously unpublished, original, archival material. It provides an appraisal of the discontinuities in the path leading to the publication in 1960 of Production of Commodities by Means of Commodities since its conception in the late 1920s. 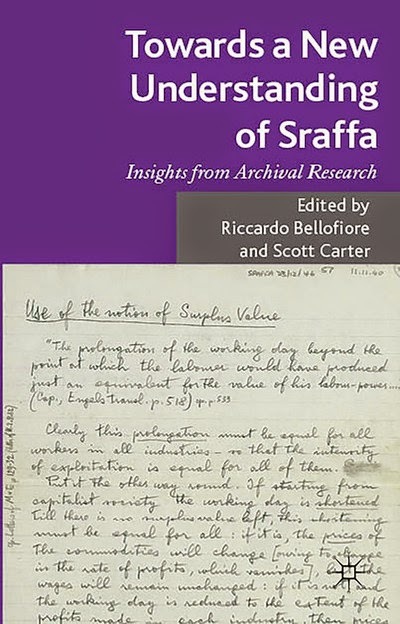 It unlocks significant new perspectives about the connection of Sraffa to Marx regarding Standard commodity, the macro-social and monetary theory of exploitation, the tendency of the rate of profit to fall, and the transformation of values into prices of production. It also offers insights on how Sraffa dealt with money in the various phases of his thinking, and explores his ideas about the role of equilibrium and of the surplus in economic theory. It concludes with an account of some recent Sraffa scholarship and points towards future research avenues. PS: (Matías here) There was a special issue of the Cambridge Journal of Economics on the topic here, with a response by Heinz Kurz here (subscriptions required). (David here) And here is an earlier piece by Kurz on Sraffa's unpublished manuscripts, in relation to the history of economic thought. The title comes from Joan Robinson's famous essay. However, the motivation is to clarify some comments on a previous post on what Keynes meant by unemployment equilibrium (sent to me, but not published). There is a relatively widespread notion among some post-Keynesians that neoclassical economics assumes always a single unique equilibrium, and that Keynes, or at least his closer followers like Robinson, believed in multiple equilibria. The idea is that post-Keynesians believe in an unstable, uncertain capitalist system in which full employment is only one possibility. "it is an outstanding characteristic of the economic system in which we live that, whilst it is subject to severe fluctuations in respect of output and employment, it is not violently unstable. Indeed it seems capable of remaining in a chronic condition of sub-normal activity for a considerable period without any marked tendency either towards recovery or towards complete collapse. Moreover, the evidence indicates that full, or even approximately full, employment is of rare and short-lived occurrence. Fluctuations may start briskly but seem to wear themselves out before they have proceeded to great extremes, and an intermediate situation which is neither desperate nor satisfactory is our normal lot." So what Keynes said is pretty clear, fluctuations around a normal equilibrium. Unemployment is the normal position, the long run equilibrium around which the system fluctuates. Like the old classical political economists (e.g. Smith, Ricardo, and Marx) and the marginalists of his time (e.g. Pigou, and Marshall) Keynes believed in a single stable long run equilibrium position. Note that nothing in Keynes analysis implies that the long run equilibrium is ever attained, or that it cannot be affected by the process by which it is approached, and, hence that it would be path-dependent [the supermultiplier story with a Kaldor-Verdoorn process is path dependent and is still a long run equilibrium position]. 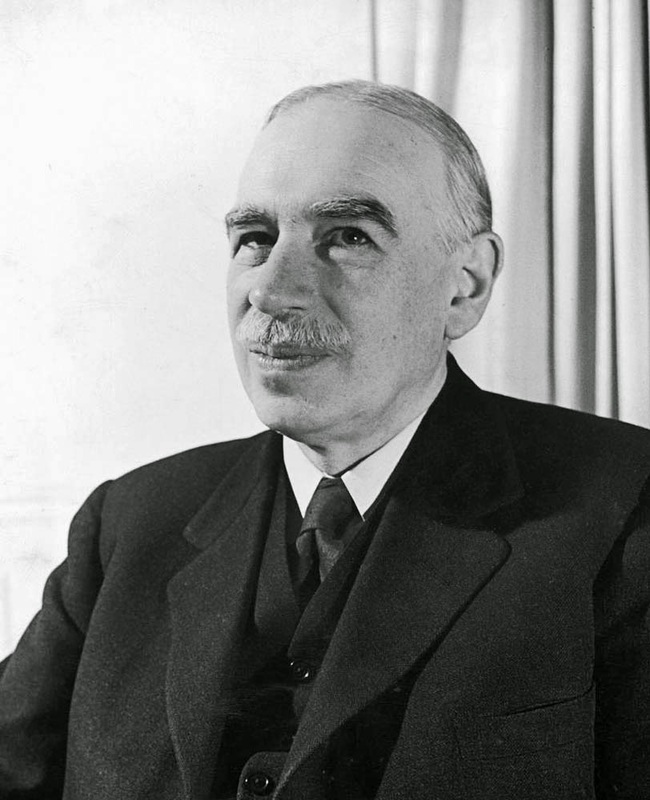 The problems associated to the negative impact of uncertainty, and failed expectations, and the institutions and conventions that are relevant in a certain historical context to minimize the effects of instability are all part of the normal operation of the economy for Keynes, and not, like in neoclassical models, superimposed on an essentially stable system. In other words, Keynes equilibrium theory is not a-historical, and hence does not require the addition of more realistic (historical?) elements to provide explanation of say why the system is stuck below full employment equilibrium. For example, lack of demand (caused by stagnant wages and not enough fiscal stimulus) means that the US economy will the near future fluctuate around levels of unemployment that are above the previous normal levels. 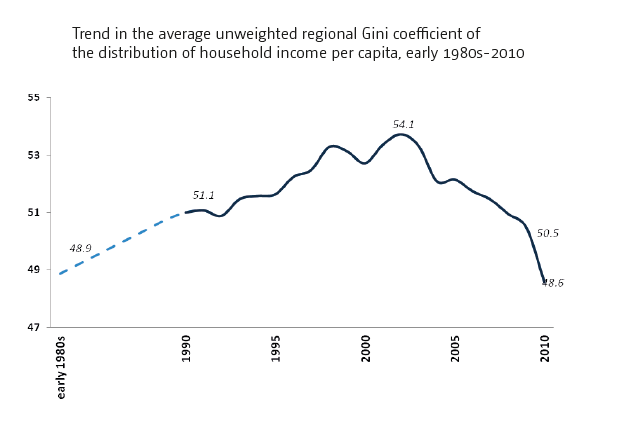 In the graph below (source) that is visible in a trend that was lower in the 1950s and 1960s, and goes up in the 1970s and 1980s, only to go down (as a result of a series of bubbles) in the 1990s, and, as I suggested, is likely to go up again. This trend represents the normal position to which Keynes alluded in the passage cited above. 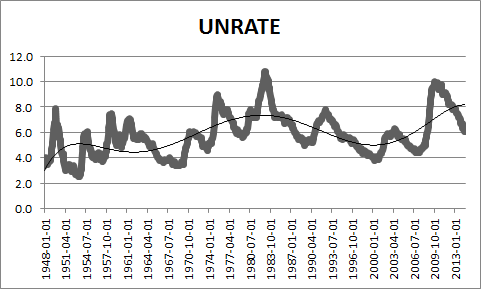 Unemployment fluctuates, but is not violently unstable (sometimes it might be; asks the Greeks). In the neoclassical model, in contrast, without imperfections, be that price rigidities or lack of information or any other kind, the system would move to full employment. That's why they often resort to change what the meaning of full employment is (the natural rate goes up; nudge, nudge; wink wink). However, the interesting thing is that while the old neoclassical authors shared the classical political economists and Keynes notion of a stable long run equilibrium (optimal for the neoclassical, and not so for Keynes and the classical authors), they have departed from that view after the capital debates. In fact, it is in the Walrasian world of Arrow-Debreu's intertemporal equilibrium, that the notion of multiple equilibria becomes relevant (for the reasons why the mainstream changed their views on equilibrium go here; Garegnani classic paper titled "On a Change in the Notion of Equilibrium in Recent Work on Value" is the source of this idea). But in that world, anything could happen, it is wildly unstable and there no forces bringing the economy back to its normal position. Certainly not what Keynes thought, and also not an accurate description of the graph above. More importantly, the very idea of long run equilibrium is central to our ability to theorize about the functioning of real, historically and institutionally specific economies. It is the fact that there are persistent forces, with regularities, which allows to say something meaningful about the functioning of the economy. If uncertainty rendered economic calculation impossible, then even Keynes' theory about how effective (autonomous) demand determines income, would be irrelevant, and in that case post-Keynesians would have (notice I said would have, since I don't think this is the right way to describe post-Keynesian economics) more in common with the modern neoclassical economists that have embraced multiple equilibria and all sorts of imperfections. Throughout her career as an author, analyst, congressional staff economist and teacher, Ms. D’Arista has brought together several strands of heterodox economics. While she may be characterized accurately as one of the last great institutionalists, her work also defies easy classification. Perhaps the clearest way to view Jane is as a tough-minded empiricist who has produced critical, original insights into the functioning of the financial system and economy – and done so with the uncompromising goal of improving human welfare. From the Introduction to the book Banking, Monetary Policy And The Political Economy Of Financial Regulation: Essays in the Tradition of Jane D'Arista. Read rest here. Jerry Epstein posted this on Elgar's blog too. PS: Jane is also a poetess, see her book here. 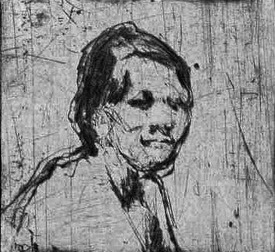 The drawing of her above was done by Robert D'Arista, her late husband. In theory, governments can boost spending in two ways: through fiscal policies (such as lowering taxes or increasing government spending) or through monetary policies (such as reducing interest rates or increasing the money supply). But over the past few decades, policymakers in many countries have come to rely almost exclusively on the latter. The shift has occurred for a number of reasons. Particularly in the United States, partisan divides over fiscal policy have grown too wide to bridge, as the left and the right have waged bitter fights over whether to increase government spending or cut tax rates. 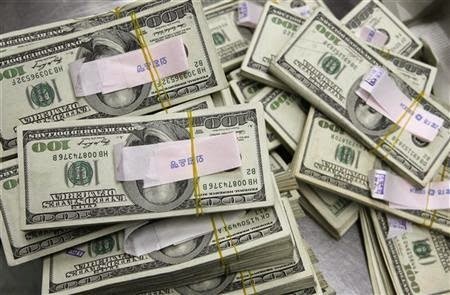 More generally, tax rebates and stimulus packages tend to face greater political hurdles than monetary policy shifts. Presidents and prime ministers need approval from their legislatures to pass a budget; that takes time, and the resulting tax breaks and government investments often benefit powerful constituencies rather than the economy as a whole. Many central banks, by contrast, are politically independent and can cut interest rates with a single conference call. Moreover, there is simply no real consensus about how to use taxes or spending to efficiently stimulate the economy. 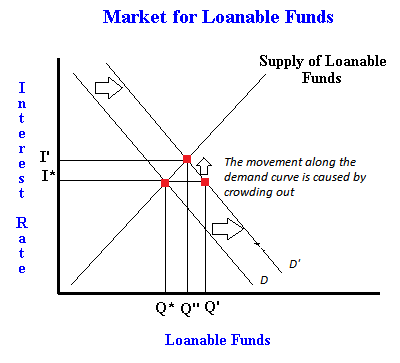 Recently, Lars P. Syll posted a critique of the loanable funds theory (see here), and Matias Vernengo provides his take here. Below is a paper by Giancarlo Bertocco, in which he provides an analysis of Keynes' criticism of LFT. Contemporary monetary theory, by accepting the theses of the Loanable funds theory, distances itself from Keynes, who considered the rate of interest as an exclusively monetary phenomenon, and overlooks the arguments Keynes used, following publication of the General Theory, to respond to the criticism of supporters of the Loanable funds theory such as Ohlin and Robertson. This paper aims to assert that the explicit consideration of the role of banks in financing firms‘ investments connected with the specification of the finance motive does not imply acceptance of the LFT, which holds that the interest rate is a real phenomenon determined by saving decisions, but makes it possible to elaborate a theory of credit alternative to the LFT and a sounder theory of the non neutrality of money than the one based on the liquidity preference theory. Read rest here and here. "Economics is a science or a series of beliefs? The current crisis foretells the end of a system or its umpteenth transformation? Is the economy at man’s service or is it his master? 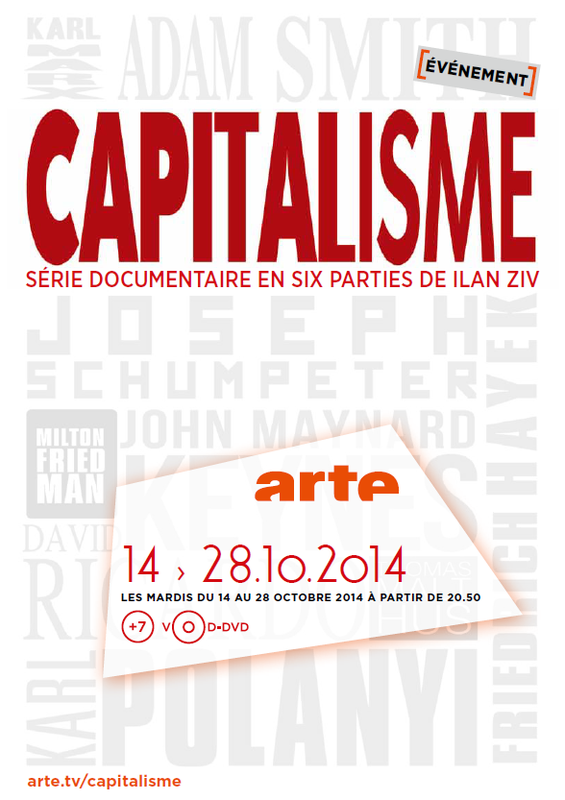 What is the relationship between capitalism and democracy? Through the reflections of many international experts (Robert Boyer, Ha-Joon Chang, James Galbraith, David Graeber, David Harvey, Kari Polanyi Levitt, Eric Mielants, Thomas Piketty, Robert Skidelsky, Yanis Varoufakis and Matías Vernengo) and thanks to a great wealth of archives we analyze the backstage and the contradictions of a system that underpins our everyday lives." Recent paper reviewing the role of the IMF after the Global Crisis and the supposed changes in its theoretical views and policy stances, co-authored with the late Kirsten Ford. We concluded that: "The IMF remains fundamentally an instrument of advanced and creditor countries, to force contractionary adjustments on poor, indebted countries." So the whole change is a slightly higher inflation target, and a bit more expansionary fiscal policy, when the rate of interest is close to zero. You can read the rest, but if you have doubts about policy check what are the ones promoted by the IMF in the European periphery. As we argue: "If there is any change in the IMF policy advice it is difﬁcult to ﬁnd in its policies." Jamie Galbraith on why the distinction between Saltwater and Freshwater (at minute 26 or so of the video) is not a good one, and why we need Backwater economics. Backwater is actually a good name, since it may be caused by an opposing current, and that's what heterodox economics should be, a counter current to the main stream. The other parts of the panel with Krugman and Buiter here and here. This was during the INET Rethinking Economics conference, by the way. Interview on Charlie Rose on his new book. 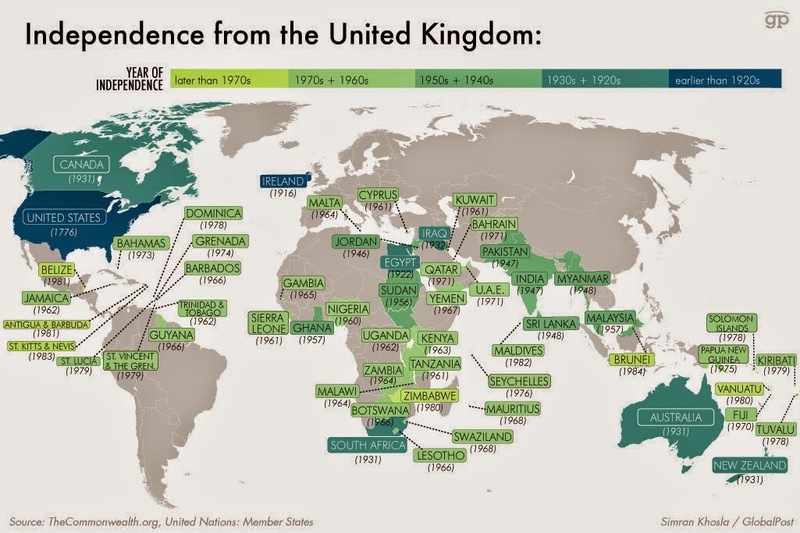 So, as the map above shows, independence from the UK is nothing new. And I personally have no particular opinion on whether independence is good or bad for Scots, although many on the left seem to think it's a good idea. However, it is undeniable that independence and maintenance of the pound is a terrible idea. 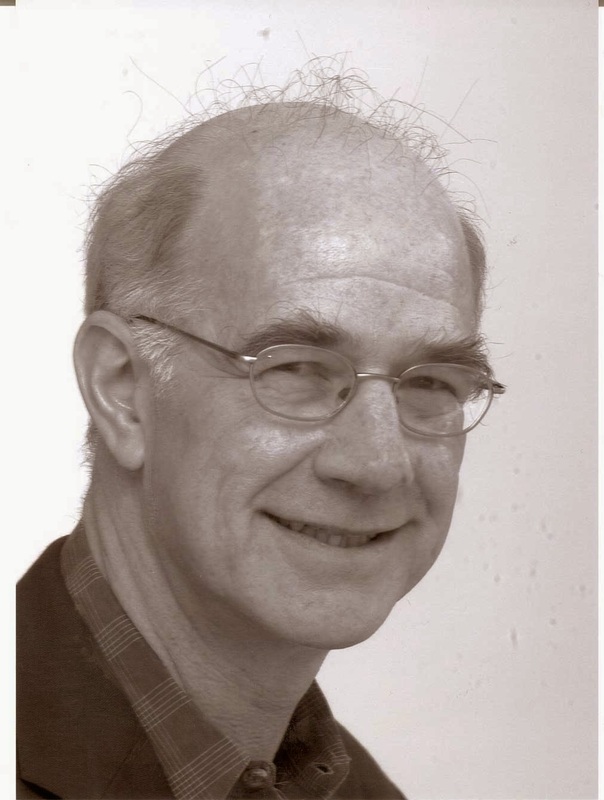 Here is Wynne Godley, who I should add was in favor of the European Union, but not of the currency union as it was organized, in 1992 (from a previous post available here). "the power to issue its own money, to make drafts on its own central bank, is the main thing which defines national independence. If a country gives up or loses this power, it acquires the status of a local authority or colony. Local authorities and regions obviously cannot devalue. But they also lose the power to finance deficits through money creation while other methods of raising finance are subject to central regulation. Nor can they change interest rates. As local authorities possess none of the instruments of macro-economic policy, their political choice is confined to relatively minor matters of emphasis – a bit more education here, a bit less infrastructure there." So much for the possibility of a more social democratic Scotland after independence. A bit more spending on education, in exchange for a lot of austerity. Mind you, these effects my take a long time. Wynne predicted the problems of the Euro in 1992. Earlier this autumn yours truly was invited to participate in the New York Rethinking Economics conference. A busy schedule didn’t allow me to “go over there.” Fortunately some of the debates and presentations have been made available on the web, as for example here. 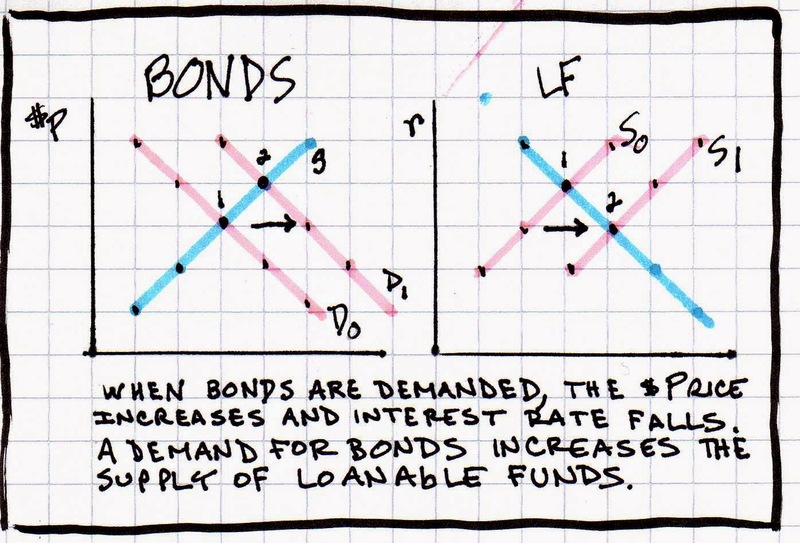 Listening a couple of minutes into that video one can hear Paul Krugman strongly defending the loanable funds theory. Unfortunately this is not an exception among “New Keynesian” economists. Neglecting anything resembling a real-world finance system, Greg Mankiw — in the 8th edition of his intermediate textbook Macroeconomics — has appended a new chapter to the other nineteen chapters where finance more or less is equated to the neoclassical thought-construction of a “market for loanable funds." For an explication and presentation of the extent to which LFT is derivative of modern neo-Wicksellian macroeconomics, see here. A FESSUD Working paper by Ben Fine. The purpose of this paper is threefold. First is to comment upon the nature of financialisation. Second is to frame how this leads financialisation to be understood whether consciously or otherwise. And, third, is to draw out implications for surveying households as their experiences and understandings of, and reactions to, financialisation without specifically designing a questionnaire itself for this purpose. As should already be apparent, underpinning this contribution is the presumption that financialisation is a characteristic of contemporary capitalism (and that the term is also an appropriate category for representing this characteristic). The material culture of financialisation is addressed by drawing upon the 10 Cs approach that was developed for the study of consumption, highlighting how it is Constructed, Construed, Commodified, Conforming, Contextual, Contradictory, Closed, Contested, Collective, and Chaotic. New ILO Book: "Transforming Economies - Making industrial policy work for growth, jobs and development"
Be sure to see the chapter by Robert Hunter Wade - "The mystery of US industrial policy: the developmental state in disguise" - on page 379. The book is available as a pdf for free download here. Noah Smith, now writing regularly for Bloomberg, had a piece on this subject. There are a few good points on how New Keynesians are really followers of Friedman, something Mankiw admitted long ago, and how everybody including conservative economists (meaning GOP economists like John Taylor and Ben Bernanke) are New Keynesians (these would be the potty trained GOP economists, not your supply-side fringe economists like Arthur Laffer). Note that this is essentially correct as pointed out here before, since New Keynesians accept fully Friedman's notion of a natural rate of unemployment, while Keynes explicitly said he wanted to reject the twin concept of a natural rate of interest. Noah also suggests that Keynes only wanted stabilization policies, and no redistributive policies, which is more open to debate. Keynes was certainly a moderate reformer trying to save capitalism from itself, and was no fan of the Soviet experiment. On the other hand, he was an Asquith liberal, meaning concerned with the expansion of the welfare system, and knew that laissez-faire, if it had advantages in the past, was essentially dead. In the General Theory (GT) he famously starts chapter 24, on his social philosophy, with the idea that: "the outstanding faults of the economic society in which we live are its failure to provide for full employment and its arbitrary and inequitable distribution of wealth and incomes." That is, income distribution is squarely in the middle of his preoccupations, and the socialization of investment at the center of his solution (let alone the euthanasia of the rentier). Using public investment, and one would imagine taxes, to deal with employment and income distribution, plus compressing the remuneration of rentiers, and keeping low rates of interest to expand the safety net, are not simply stabilization policies. On the main topic of his piece, however, Noah is simply wrong. He argues that the reason why: "people think Keynesianism is socialism-lite [is] the fault of Keynes’s main intellectual opponent, Friedrich Hayek." First, while it's true that Keynes and Hayek had a few debates in the 1930s (but the key Keynesian author in these debates was actually Sraffa, not Keynes), prompted by Lionel Robbins plan to make the London School of Economics (LSE) an alternative to Cambridge, it is preposterous to say that Hayek was the main intellectual opponent of Keynes. In the GT, it was his own teacher Pigou, and the Marshallian tradition in Cambridge that Keynes was battling. In his personal debates Robertson was certainly more relevant than almost any other conventional (Marshallian) economist. Hayek was irrelevant. Second, Hayek basically vanished, literally, after the 1940s only to reaper in the 1970s as a result of his dubious "Nobel"/Bank of Sweden's prize (see Sissela Bok's, Myrdal's daughter, story on that topic). By that time Keynes and Keynesianism were already dirty words. Early on Keynesian ideas were associated, fairly or not, with Roosevelt and the New Deal in the US, and then to the war coalition government in the UK, the Beveridge Report and the post-war Labour reforms. Keynesian economists were in many cases persecuted, like Lauchlin Currie, the first economist to work inside the White House, and one of the early Keynesians. But by the 1950s and 1960s (particularly after the Kennedy administration) one kind of Keynesianism was dominant anyway (the Kennedy tax cut and the economists working for his administration are the symbol of the dominance of Keynesian ideas). So you ask why indeed did Keynesianism become a dirty word? Simply because even if Keynes had differences with Roosevelt (FDR was actually a sound finance guy) and with Labour, his ideas did provide the intellectual basis for New Deal policies, particularly after the 1937-38 recession, and for the expansion of the Welfare State in general. The economists that where against these policies by the 1940s were in the minority. Mont Pelerin is, if anything, prove of their sheer irrelevance. Friedman years later would complain about how ostracized he was (but less than Hayek, since he accepted the ISLM/Phillips curve apparatus of the Neoclassical Synthesis Keynesians; and that's why New Keynesians, who are really followers of Friedman, can say they are Keynesian, by the way). Liberalism, in the US sense of the word, was at its height. But the rise of conservatism (Goldwater was a joke back then) eventually transformed liberalism into a dirty word (that's why we use progressive now rather than liberal). Hayek was resuscitated very much like conservative ideas. By the big bucks of business leaders and their think tanks that were against the New Deal. The rise of Hayek or of his renewed respectability results from the same forces that explain why Keynesianism and the New Deal kind of welfare policies fell in disrepute, to the point that Niall Ferguson could say that Keynesianism was flawed because Keynes was childless and gay. Oh well. 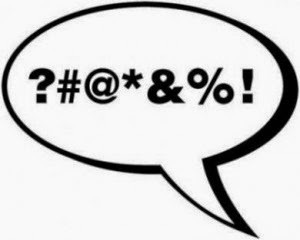 PS: In fact, the title of this blog is related to the view that Keynesianism is a dirty word, and that some people (Galbraith) unashamedly teach naked Keynesianism to innocent college kids. For more see here. I tend to disagree a lot with Krugman, at least on theoretical issues. His brand of Keynesianism supposes that the system doesn't work because of imperfections. For him, the current slow recovery is due to the fact that the natural rate of interest is basically negative and you cannot use monetary policy to stimulate the economy (see critique of this here). However, on his recent debate with Lars Syll (and here; Brad De Long also posted here), a post-Keynesian, with whom I probably share a more radical interpretation of Keynes and its relevance for economic theory, Krugman seems to get things right. The main points in Lars initial post, based on Minsky's book John Maynard Keynes is that traditional representations of Keynes do not emphasize the cyclical component of Keynes' theory and that true or fundamental (non-probabilistic) uncertainty is often ignored. Lars adds a little bit more on his response to Krugman and De Long, but essentially is the same argument. Keynes didn't like the ISLM (which is from a historical point of view difficult to defend, after all the only stuff he wrote on this, to Hicks, was quite positive, even if it is of little relevance), that it is static (not paying attention to cyclical or dynamic phenomena), and perhaps more interestingly that the interaction of real and monetary variables in the model is simplistic. Krugman points out that the General Theory (GT) is NOT about cyclical fluctuations per se. It is about the determination of the long run level of output and employment, around which the economy fluctuates, and he correctly notes that cycles only appear as an afterthought in chapter 22 of the GT. And that is precisely correct. The GT is revolutionary because it suggests that with price flexibility (not price rigidity as in the old Neoclassical Synthesis or the New Keynesian stories) the system gets stuck in a situation of unemployment equilibrium. Emphasis on equilibrium. Yes, unemployment at less than full employment and output below its potential level are both together in an equilibrium situation. Patinkin suggested that Keynes meant unemployment disequilibrium, since within the neoclassical framework, unless there is a rigidity of some sort, and the system should go to its long run equilibrium position with full employment. Minsky (1975, p. 268), in the book cited above, says that Keynesian economics should be seen as the: "economics of permanent disequilibrium." That has no basis on the GT. Actually, the GT would be a less radical book if it only said that with instability the system might be always in a disequilibrium position. Keynes was very radical since he argued that the very notion of a natural rate should be abandoned (on this Paul and Brad have a lot to learn). Some Post Keynesians tend to dislike the idea of equilibrium (echoes of Joan Robinson's late critique of the idea), which ends up making them closer in many respects to the modern mainstream authors with their dislike for long term equilibrium positions. So the GT is not about cycles (Keynes' Treatise on Money, a very conventional and Wicksellian book was about cyclical disequilibrium caused by differences between the natural and banking rates of interest, which, interestingly enough is closer to Krugman's way of thinking than the GT, or than to Lars, who is aware of the limitations of the natural rate concept). But that's not all that Krugman got right this time. He quotes the famous passage in which Keynes says that the system is not violently unstable (GT, p. 249). And while Post Keynesians are correct to note the relevance of fundamental uncertainty, it is important also to consider the stabilizing role of conventions and institutions, to which Keynes alludes. Expectations play a role, but investment is not completely volatile, and it was a problem for Keynes only when "the capital development of a country becomes the by product of the activities of a casino" (GT, p. 159). In fact, given the relevance of the accelerator in determining investment, the central role of expectations is about the level of demand. For example, in the US investment has been subdued since demand is not growing fast and there are not reasonable expectations that it will any time soon. "Short-sighted, in that it is not Hicks who would be Minsky’s long-run intellectual adversary but rather Freidman [sic], Lucas, and Hayek, and so building bridges to the Hicksians ought to be a very high priority." Probably true, but from a policy point of view. From a theoretical point of view, Hicks use of the marginalist notion of an investment function inversely related to the rate of interest (something Keynes also used) implies that there would be a rate of interest low enough that would produce full employment, that is a natural rate, which would preclude Keynes' claim about unemployment equilibrium (and the absence of a natural rate). In other words, with the marginal productivity of capital you have that unemployment must be a disequilibrium situation caused by some imperfection that inhibits the system from reaching the natural rate. And yes the capital debates are relevant since they show that the inverse relation is only possible in a one commodity world. No natural rate, and no need to think about imperfections. And that's why the comment by Lars on the connection between real and monetary variables being simplistic within the ISLM is right on the mark. The idea that the central bank controls a monetary rate, that may get out of whack with the natural, and that by manipulating it can affect real variables is limited at best. PS: For my previous defense of a modified ISLM go here and here. A series of papers that provide more than a review a collective response to Piketty's book can be found here. It was part of a mini-symposium organized by Lance Taylor, co-sponsored by the New School and INET. 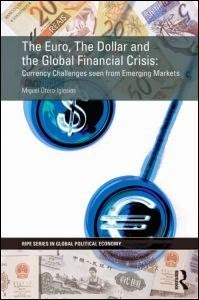 ***My RIPE paper with Matias Vernengo, "Hegemonic Currencies During The Crisis, The Dollar Versus The Euro In a Cartalist Perspective" (see here), is cited. Below is an excerpt from Keynes' "Essays In Persuasion" (1930), in which he provides his invaluable insights on human potentialities concerning human freedom during the Great Depression. Notice that the overall message is quite relevant to the turbulence of today. (h/t to Nate Cline for noticing that in the first part of the essay Keynes, in fact, is very un-Keynesian in the sense that he accepts the 'natural rate' theory of capital & unemployment). We are suffering just now from a bad attack of economic pessimism. It is common to hear people say that the epoch of enormous economic progress which characterised the nineteenth century is over; that the rapid improvement in the standard of life is now going to slow down – at any rate in Great Britain; that a decline in prosperity is more likely than an improvement in the decade which lies ahead of us. I believe that this is a wildly mistaken interpretation of what is happening to us. We are suffering, not from the rheumatics of old age, but from the growing-pains of over-rapid changes, from the painfulness of readjustment between one economic period and another. The increase of technical efficiency has been taking place faster than we can deal with the problem of labour absorption; the improvement in the standard of life has been a little too quick; the banking and monetary system of the world has been preventing the rate of interest from falling as fast as equilibrium requires. And even so, the waste and confusion which ensue relate to not more than 7½ per cent of the national income; we are muddling away one and sixpence in the £, and have only 18s. 6d., when we might, if we were more sensible, have £1; yet, nevertheless, the 18s. 6d. mounts up to as much as the £1 would have been five or six years ago. We forget that in 1929 the physical output of the industry of Great Britain was greater than ever before, and that the net surplus of our foreign balance available for new foreign investment, after paying for all our imports, was greater last year than that of any other country, being indeed 50 per cent greater than the corresponding surplus of the United States. Or again-if it is to be a matter of comparisons – suppose that we were to reduce our wages by a half, repudiate four fifths of the national debt, and hoard our surplus wealth in barren gold instead of lending it at 6 per cent or more, we should resemble the now much-envied France. But would it be an improvement? The prevailing world depression, the enormous anomaly of unemployment in a world full of wants, the disastrous mistakes we have made, blind us to what is going on under the surface to the true interpretation. of the trend of things. For I predict that both of the two opposed errors of pessimism which now make so much noise in the world will be proved wrong in our own time – the pessimism of the revolutionaries who think that things are so bad that nothing can save us but violent change, and the pessimism of the reactionaries who consider the balance of our economic and social life so precarious that we must risk no experiments. My purpose in this essay, however, is not to examine the present or the near future, but to disembarrass myself of short views and take wings into the future. What can we reasonably expect the level of our economic life to be a hundred years hence? What are the economic possibilities for our grandchildren? I do not know whether the Scots should vote for independence. I assume that the odds are they will vote against it. I do know that the reasons advanced for voting against independence by business interest are false. Indeed, the opposite of what they claim is far more likely to be true. What I find a joy to behold, however, is the suggestion by the banksters that the Scots should get their economic advice about independence from a group of failed and often fraudulent parasites and that they should avoid any action that creates “uncertainty” or would cause them to act as a Nation rather than a U.K. province. There is a serious effort to make independence from the Brits sound like the path of economic madness. Each of these asserted business bases for cowering from independence is an insult to the people of Scotland. In an irony that, if the polls are accurate, is increasingly sensed by Scots, the business arguments against independence, unintentionally, have made a compelling case for independence. 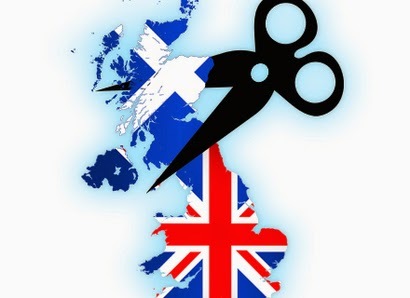 The thrust of the Brit’s strategy is to promise that they will try to cripple Scotland economically should it vote to restore its independence and sovereignty. Thus we see the English, and their EU allies, claiming that they would prevent Scotland from joining the EU or extort it to adopt the euro (a terrible idea) as a condition of entry into the EU, block its ability to continuing to use the pound as its currency, and even major businesses in Scotland threatening to flee the Nation should it vote in favor of independence. Labor leader Ed Miliband went so far as to threaten to place armed border guards on the border with Scotland should the Scots vote to restore their sovereignty. The International Labor Organization (ILO) argues that beyond the Millennium Development Goals (MDGs), the international community should also address the structural underpinnings behind poverty, inequality and sustainability, the lack of decent jobs. For more information on the book, with the same title, and the link to the data set go here. Classics by Michael Burawoy, from "Manufacturing Consent" to "The Politics of Production"
The current stage of capitalism is characterized by the increased power of finance capital. How to understand the economics of this shift and its political implications is now central for both the left and the larger society. There can be little doubt that a signature development of our time is the growth of finance and monopoly power. In 1980 the nominal value of global financial assets almost equaled global GDP. In 2005 they were more than three times global GDP. The nominal value of foreign exchange trading increased from eleven times the value of global trade in 1980 to seventy-three times in 2009. Of course it is not certain what this increase means, since such nominal values can fluctuate widely, as we saw in the Great Financial Crisis. They cannot be compared directly and without all sorts of qualifications to the value added in the real economy. But they do give an impressionistic sense of the enormous magnitude by which finance grew and came to dominate the economy. Between 1980 and 2007, derivative contracts of all kinds expanded from $1 trillion globally to $600 trillion. Hedge funds and private equity groups, special investment vehicles, and mega-bank holding companies changed the face of Western capitalism. They also brought on the collapse from which we still suffer. Ordinary people may not be acquainted with the numbers (and even those best informed are not sure of their significance), but people generally understand in different and often deep ways what has been happening: namely, an ongoing process of financialization that has come to dwarf production. There are many explanations for why some nations are rich while others are poor. The dominant view, in mainstream (neoclassical) economic circles is that institutions are the central cause of the divide between developed (center) and underdeveloped (periphery). I discussed before (here and here) the role of institutions vis-à-vis geography and culture. I have also noted how the New Institutionalist argument concentrates on the institutions (fundamentally property rights) that act on the supply side of the economy. That is growth arises because property rights provide incentives for productive investment. I also noted (here) that the historical evidence for patents, copyright and other forms of property protection for explaining growth is limited at best. Note that mainstream authors and heterodox authors, at least the majority, tend to agree that institutions rather than geography or culture are central for development. Also, the table above suggests that cultural and geographical explanations tend to put an emphasis on the supply side, but that is not necessarily the case, and it would be difficult to speculate about what Jared Diamond, for example, thinks about the relative role of supply and demand. Also, it’s worth noticing that while in his early work economic historian David Landes favored a demand-led view (which I tentatively put in the institutional box) he clearly moved to a cultural supply-side interpretation in his later work. So if you believe most heterodox economists institutions are relevant, but not primarily those associated to the supply side; the ones linked to the demand side, in Keynesian fashion are more important than the mainstream admits. Poor countries that arrive late to the process of capitalist development cannot expand demand without limits since the imports of intermediary and capital goods cause recurrent balance of payments crises. The institutions that allow for the expansion of demand, including those that allow for higher wages to expand consumption and to avoid the external constraints, are and have been central to growth and development. The role of the State in creating and promoting the expansion of domestic markets, in the funding of research and development, and in reducing the barriers to balance of payments constraints, both by guarantying access to external markets (sometimes militarily, like in the Opium Wars) and reducing foreign access to domestic ones was crucial in the process of capitalist development. In this view, for example, what China did not have that England did, was not lack of secure property rights and the rule of law, but a rising bourgeoisie (capitalists) that had to compete to provide for a growing domestic market that had acquired a new taste (and hence explained expanding demand) for a set of new goods, like cotton goods from India, or china (porcelain) from… well China, as emphasized by economic historian Maxine Berg among others (for the role of consumption in the Industrial Revolution go here). Or simply put, China did not have a capitalist mode of production (for the concept of mode of production and capitalism go here). Again, I argued that Robert Allen’s view according to which high wages and cheap energy forced British producers to innovate to save labor, leading to technological innovation and growth, and the absence of those conditions in China led to stagnation is limited since it presupposes that firms adopt more productive technologies even without growing demand. The same is true of Latin American economies, which several authors like Engerman Sokoloff suggest fell behind as a result of absence of secure property rights. Latin American economies entered the world economy to produce silver (mining-economy/Amerindian population), sugar (plantation-economy/African-American population) and other commodities, for external markets. They were exploitation colonies, less reliant on the development of domestic markets, typical of settlement colonies in the Northeast United States or of the central countries in Western Europe. 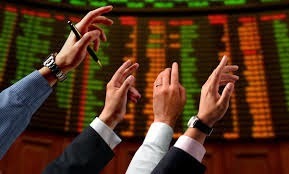 The economies that depend on the production of commodities for world markets and import everything else are more vulnerable to the fluctuations of the price of commodities. Booms in commodity prices lead to growth, albeit very concentrated in the hands of the owners of capital, but they leave very little in terms of infrastructure for future growth. Further, since the economy must import everything to satisfy domestic demand, the economy is dependent on external sources of production, and when the export of commodities does not allow for enough imports, then either demand must be curtailed or the economy must become indebted to be able to continue to consume. A thriving domestic market is central for economic development, and the ability to diversify production to provide for the market is the key to catching up. * I discussed here how the industrialization of Britain meant the deindustrialization of India and China.